There are so many tips and techniques out there on how to make jewelry and related crafts. I do like researching and collecting these tips and techniques so that the whole process of making jewelry is easier, more professional, and more fun. Here I continue to gather together a collection of How-To not just with respect to jewelry making but to other crafts and related fields of interest like wire work, felting, knitting, crochets, etc. Honestly it is anything that comes across my path that I find useful and interesting. And as mix media is increasingly popular and trendy, the lines between jewelry making and other forms of artistic endeavours are merging nicely. 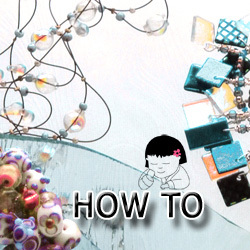 There is also a section on free beading patterns/ tutorials on how to make jewelry. JEWELRY CHART - ring sizes, Swarovski color charts, wire gauges, etc. Headpins/Eyepins: soft vs hard Pins comes in the soft and hard version. When using them to make earring (as in earring drops), use the hard version. Loops - spare length for Closed loops Leave at least 3cm (about 1½ inch) spare length of wire when you are making a secure closed loop with wire. Loops - spare length for simple loops Leave at least 8mm (5/6 inch) spare length of wire when you are making a simple loop with wire. Straighten & Strengthen wire Using nylon-jawed pliers (so as not to mar your wire) or your fingers, and run them up and down the length of your wire a few times will strengthen the wire. Hammering wire (as with hammer and block) will also strengthen the wire. Wire Gauges - for Earrings For things like making earring drops, the most common and suitable gauge to use is between 0.6 to 0.8 mm. This will be modified depending on the size and weigth of your beads. Wire; Practising with When practising a new technique using wire (e.g. making loops with wire), use copper or silver plated wires as they are inexpensive and easy to use. Footnote: The old archived version of How Tos.